Stepping Stones: A Guide for MillennialsCooking, crafting, decorating, and gardening tips and tricks for navigating through the post-grad to adulthood transition. 1. Unplug appliances that you are not using–it will save you some money each month on your electric bill. Many electric and gas companies (including mine) charge an equal rate for the use of electricity and gas with a delivery fee. It’s a total rip-off, but as a tenant, I don’t have the option to change fuel and provider to find the best deal. Unplugging appliances that only get a short amount of use each day will add up to some savings over time. Ask yourself, does the microwave, toaster over, blender, and coffee maker need to be plugged in when I’m not home? During the middle of the night? If your answer is no, unplug them. If you are worried about having to reset the clocks on each device, don’t fret. The appliances will still work even when prompting you to set the clock, and you can still keep your oven plugged in and displaying the time. Better yet, add an analog clock to your kitchen decor to solve the issue of displaying the time. 2. Ditch the disposables. Buy reusable cloth napkins, dishtowels, washcloths, even Swiffer pads. Not only will cloth products absorb more liquid from spills, they will also be more durable and survive thousands of uses, including the wash. Disposables can be expensive, and at the very least, add up over time. Switching to reusable and washable products can last years and quickly pay for themselves, especially if you purchase very cheap ones. 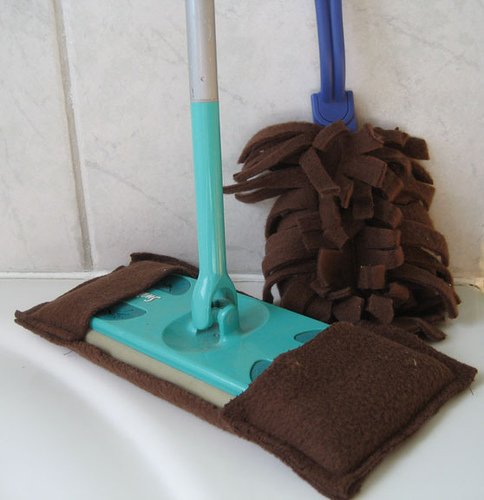 Better yet–recycle an old bath or beach towel for Swiffer pads. You might consider buying decent cloth napkins, especially if you plan to entertain. The bottom line is that reusables are some of the most cost effective products in the kitchen. 3. Upgrade the dishes. For the same money saving reason, get some real flatware (aka silverware), dishes, and cups. You don’t have to spend a lot of money at Crate and Barrel, some basics at Walmart will do. If you’re looking for a step above Walmart, go to Kohl’s or similar retailers for modestly priced, matching sets. These retailers often advertise big sales and you can grab some dishes for a good deal. Avoid plastics or materials that won’t survive repeated microwave or dishwasher abuse. Ceramic ware is a personal favorite. My personal favorite are the classic Corelle ware, a product developed in the 1950s and 1960s based on housewives’ desire to have durable and lightweight dishes.